As a firm non-believer in UFOs for most of my adult life, I have recently watched a few great documentaries that have tipped the scales in the other direction. UFO sitings were always a topic reserved for science fiction geeks and the like, but since the general public now has more access to video and photo equipment in an "on the spot" format (cell phones, etc.) the UFO sitings have been pouring in as of late. If you haven't seen it already, and you have NetFlix (which is an AWESOME program by the way), then you should definitely check out Dan Aykroyd's documentary on UFOs and how the world will soon be forced to publicly release information about UFOs in order to further our education on this topic...if nothing else, for our own safety. According to Aykroyd in this documentary, it is only a matter of time before a UFO appears at a large enough gathering of people (rock concert, sporting event, etc) that will witness a UFO sighting together and validate this phenomenon. The Mexican government released some pretty good videos of a UFO sighting in 2005, and to make the UFO case even stronger many former US astronauts have come forward with UFO encounters that they had while traveling in outer space on various voyages and missions. Several credited and famous astronauts (among them Gordon Cooper) have claimed that UFOs have "followed" their missions in outer space and an increasing amount of video footage has come out recently proving their statements. Gordon Cooper claims that a group of UFOs in "military formation" followed one of his flight missions, flying directly next to Cooper's plane and even "immitating" his movements - and then showing off with some of their own moves. Many believe that the US Government designed the B-52 Stealth Bomber based on their study of documented UFO photos and possibly even recovered wreckage. Most UFO researchers believe that the US Government has definite proof of the existence of UFOs and possibly even recovered UFO wreckage in storage, hidden from the general public. I have to believe that these claims are true, and with everyone in the US walking around with video and photo recording devices such as cell phones I believe that UFOs will become a future topic of discussion, at the least. There is a very good documentary called "I Know What I Saw" by James Fox. I think it's very interesting that a great majority of witnesses of UFOs are airline pilots and our military - but they are discouraged from talking about their experiences. You are right, there is going to be a lot more talk about this since almost everyone has a camera in their possession 24/7 now. It certainly makes you question a lot of things, particularly just how much we have been lied to about what actually exists and what doesn't. Kansas City UFO sightings have increased as well, just as this author noted "due to more portable recording devices in the hands of citizens". I think that part of the issue is that most people are not really paying much attention to the skies when they are out and about. I know that a UFO could fly right over my car, and unless I had my moonroof open I wouldn't even notice. Or even if I saw something in the sky I would just assume that it is some kind of military craft, etc. 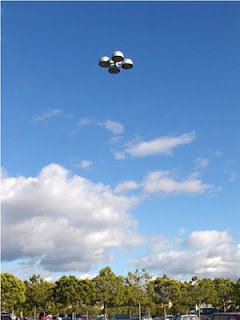 I think that it is going to be like Dan Aykroyd says, it's going to take a sighting at a large public event like a football game or an outdoor concert to put the whole UFO thing out in the open. That would be awesome if a UFO stopped by during halftime at a Chiefs game at Arrowhead! We'll keep our fingers crossed and our cell phone cameras ready. this pic looks like someone took a photo of a light pole in a parking lot and then photoshopped out the pole itself. so fake. UFO sightings in Kansas City? Hopefully they fly over my house. I need some action. I was thinking the same thing..street light! it does look like the photo is edited! ill give ya that. NOT A VERY GOOD PICTURE! Here's the deal, i was visiting Emporia one weekend, and as I was heading back home south on the KS Turnpike my friend and I saw an object in the sky over the flint hills that kind of looked like a street light with out a pole... we went back about forth try to figure out what this thing was. we decided it couldn't be any of the following,airplane (as it had NO wings! ), helicopter (as it had no propellers), or a weather ballon. after freaking out for a second I asked my friend if she had a camera on her phone...we both looked down at her phone for not even two seconds, looked back up to take a snap shot of the object and it was GONE. Now keep in mind this object didn't seem to be moving very fast at all during the time we were trying to figure out what it was, so there was no way that it could sped out of sight in less than two seconds time...very strange. No one is saying that photo above is real. Exactly, the photo was just for the article, if you think you have any REAL photos of Kansas City UFOs please send them in to us and we will post them! Yeah, that is a great ufo picture for UFO sightings in Kansas City. It does look like there might be something weird going on in that craft. I hope that the ufo turns up again and they get more photos of it. We are not alone! You can say that about ANY ufo photo genius. look to all u who don't beleive in 1998 in santa babara city college ca, i was playing soccer with the whole class when something caught my attention in mid air about 2 miles and maybe 200 yards from the ground floated out towards the ocean. The moment i saw this object i told my soccer coach and before u know the whole class was starring at this silent object floating out to sea, we had no idea what this was but i recall clearly the object looking like this one in kansas city. Now were they aliens from another planet i don't think so because the gov has these so called ufo. My friend was in the the military for many yrs and he told me the military has these drones or none human operational flying objects that humans have not yet been able to fly inside them. No joke the military will read this and try to investigate me because they want us to beleive in aliens to promote fear and control the people. Thats what its all about one world gov or community, one world religion. People are so naive its sad they believe in aliens bunch of b.s . Wow! With guys like the comment at 10:48 running around, who need aliens? This is a great UFO photo! We are starting to see more and more UFO sightings in the USA and also in Mexico and Korea, we anxiously await the next great UFO sighting in Kansas City now! Be sure and have your cell phone cameras ready just in case you see that elusive UFO coming your way. I hope that the next sighting will be at Arrowhead Stadium during a Chiefs game! The UFO in the photo above was place into the photo by use of a iPhone app called "UFO Camera Gold." But that UFO photo was never declared as real, but probably only for the article. I was thinking the same thing, that this kansas city ufo sighting photo was edited with ufo camera gold, what a great app! Hopefully they will post more of these photos as they look really cool. Even if you blow up that photo as published above so that the "ufo" fills the screen, you will see signs of photoshop blobbing in the blue area around it. That would not be on a genuine photograph. Go and compare. This one is clearly a fake for the above reason. The photo was shot by me. 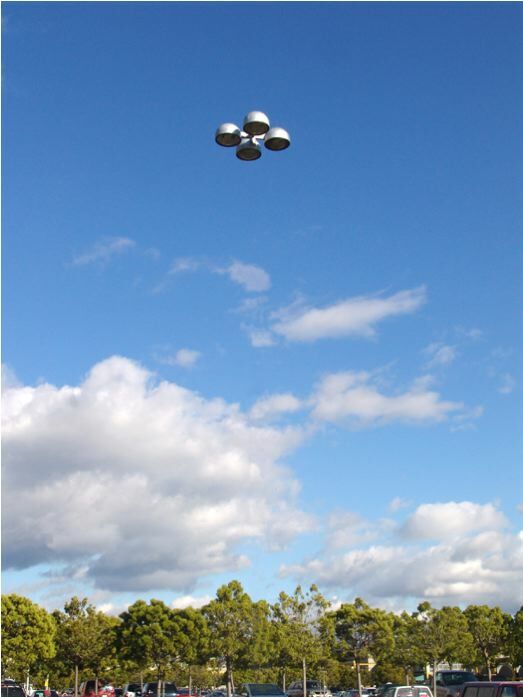 It is part of a larger series of images of ufo images that I made in 2007. Yes, it was photoshopped and no, I never intended for it to "fool" anyone. It certainly wasn’t made with an iphone app. The Kansas City News should know better than to use images without crediting the artist, but such is the nature of the internet I suppose. Please let us know if you would like it removed. We enjoy having it and have added your name to the credits now that we know that it is yours. I know deadlines are tight, and understand the re-posting is the nature of the web, but in the future you should think about using google's reverse image look-up, or TinEye to find the source and credit the artist/photographer if at all possible. Thanks for taking the time to post back. Yeah, but this one is REALLY obvious that it's a parking lot light.